*This article is a continuation of our 10 essential items to pack during a trip article. A map and compass are two of the most important items of the 10 essential items to pack during a trip into the back country. 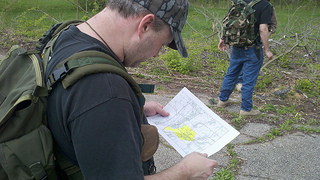 Knowing how to navigate the landscape in case you become lost can be extremely important. It could mean the difference between having to use all of your other 8 essential supplies while trying to navigate your way back to safety, or finding your way back to civilization well before you even become exhausted enough to start using the other supplies. This article gives information on the importance of a compass and map, along with what types are available to use while traveling around in the back country. Compass - Compasses were the source of navigation long before GPS devices became available. It is one of the main tools explorers used to navigate and travel around the globe. A GPS is a great device to take along during a trip, but being able to use a compass in case of an emergency where a GPS becomes unavailable could save lives. It makes a concrete back-up to a GPS due to the fact it does not need batteries, and provides hardly any additional weight to carry around. Along with a map, a compass has been viewed as one of the two components of the navigation system. Combined with the knowledge of being able to read a map; a compass can help those who become disoriented while hiking away from civilization. The most common compass is the magnetic compass, which points to the magnetic north pole. In most cases this is approximately 1,000 miles from the actual north pole. Learning how to use a magnetic compass to read maps can help a person determine the degree's of difference between the real north pole and magnetic north pole to get their bearings on their location if they become disoriented. The magnetic compass has a red arrow that always points to the magnetic north pole, while maps are lined up to point at the true north pole. Being able to read a compass so a person can plot out a course on a map between the magnetic north and true north is very important. Even being as small as 5 degrees off a point can start to make a huge difference after only traveling a few hundred yards distance. Baseplate Compass - The baseplate compass is also known as a protractor compass. The compass was first designed in 1933 by the Kjellstrom Brothers of Sweden. It has a rectangular clear plastic base that can be used as a protractor on a topographical map, and has the compass mounted onto the frame of the plastic. It has a red arrow on the base of the plastic to show the user the direction of the long axis. The red arrow points at the 0 degree marker which can rotate a full 360 degrees. This red arrow is known as the north alignment arrow, and generally a black or grey arrow for the south (180 degree) arrow. The inner materials of a baseplate compass are made of a mounted magnetic needle filled with liquid, and has a bezel that rotates gradually. The liquid is to help prevent the bezel from swinging around wildly to help users acquire a more accurate bearing on marks and locations on a map. The plastic base of the compass consists of markings of romers and scales to help assist people while trying to plot out points on a topographical map, along with a magnifying lens to help zoom in on a specific point. The plate also has a circle and arrow template to allow users to make marks for orienteering while plotting out their destination on the map. They also generally come with a nylon lanyard, that allows the user to attach it to their wrist or pocket survival kit, during the times it is not being used to help prevent it from being lost. Romer - is a simple set of lines to help people accurately plot out a grid reference on a map. It is a ruler that is specifically marked out to match the scale of a map that is being used. Scales - are used to measure the distance from different points on a map to accurately tell how far away a point or object is on a map and then convert to the actual distance needed to travel to get to the location on the map. Lensatic Compass - The lensatic compass is traditionally known as the military compass. There is a commercial and military version available for people to use to determine how to get from point to point on a map. The main difference between the two is that the military version has more durability, in addition to better accuracy when the bezel turns, than store bought version of the lensatic compass. Consumers can go to a military shop to buy the better version, or through various other means such as online purchases. People who want to use this version should do a bit of research before buying a lensatic compass to make sure it is in fact a genuine version. Some stores and web sites offer 'genuine' versions for fairly cheap prices that are not the real deal. This could lead to having a less than accurate compass that has the potential to break easily. One way to tell the difference between the two is the genuine version uses an electromagnetic induction on a magnetized compass dial, and the more common liquid filled compass with a magnetic compass dial. The consumer version is usually an air or liquid filled bezel with a magnetic needle. Sighting Wire - A wire used for setting an azimuth heading on a landmark. The front and rear end of the wire connect to each other to line-up for sighting in the landmark. Luminous Sighting Dots - Used for night navigation and low light situations. Graduated Straight Edge - After opening up the compass to a flat position, this is the upper half of the scale (set to 1:50,000) that acts as a measuring device on the map. It lets the user determine the distance on a map to convert to the actual distance they have to travel to reach the desired point. Bezel Ring - the ring that rotates 120 times at 3 degrees per tick to get a full 360 degree rotation. Luminous Bezel Line - Used for navigation at night or to mark a course direction during the daytime. Luminous Heading - Line that lights up during low light to help users set a heading. Floating Dial - The floating dial is mounted on a pivot that allows it to move freely while it is being held at level. Printed on the dial is a scale. On the outer part the black scale represents the mils, and the inner red scale represents the degrees. The arrow always points to the magnetic north, and the E is always at 90 degrees and W is always at 270 degrees. Fixed Index Line - Black Line on the cover of the case that is used to help line up points. Thumb Loop - The thumb loop allows users to hold them compass with their thumb to allow users to get a more stable setting while marking points or setting an azimuth. Lanyard Ring - Allows users to attach a nylon rope or string to tie down or wrap around the wrist to help ensure the compass doesn't get lost while not in use. Luminous Magnetic Arrow - Is part of the floating dial, and always points to the magnetic north. Pocket Compass - A pocket compass is a small easy to read compass that easily fits around a key ring or inside a pocket. It has the basic feature of a floating dial that is generally marked red for north and white for south. Pocket compasses generally have very few degree markings due to their smaller size. Prismatic Compass - A prismatic compass is generally used for surveying, and does not make for as useful of a compass as the baseplate or lensatic compass do. It has a triangular glass prism that can be read while taking a heading on a sight. Thumb Compass - A thumb compass can attach to a person's thumb with an elastic band. It is smaller than a normal sized compass, which gives it less room for features. It has very few degree markings, a clear frame to allow the user to orient their position on a map, along with a red and white dial for telling where magnetic north is located. 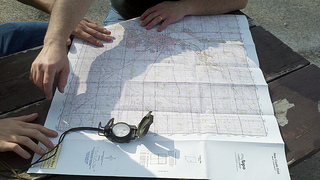 Topographical Map - Part of the Navigation process requires the ability to read a map. With GPS devices being the main source of navigation since the turn of the century, more and more people have missed the opportunity to learn how read a map and compass for back-up navigation purposes. A GPS device is great for navigation in populated areas. Going to a new city that you might not be familiar with can be tricky when you are looking for a coffee shop or store, and miss street signs, get distracted by pedestrians, or even construction zones that might cause a detour are all diminished from the help of GPS devices. On the other hand, a whole new series of problems comes to fruition once people are outside of the city if a GPS is damaged, lost, or runs out of power. Having a back-up plan that includes a waterproof map that is readable is necessary for those are going to travel anywhere that does not have a clearly defined path to stay on. Even then, if you are separated from a path and become disoriented on how to get back to your last location, it is still wise to have a readable map on your person to reorient yourself. This will help find a way back to a desired point by helping to identify any type of markings that will help plot out a path to reach it. Generally there are no street signs or other identifiable markers out in the wilderness. Relying on terrain points that are on a map can be the only way reorient yourself if you become lost out in the middle of nowhere. A GPS can point you in the right direction to get back to your car, but it will only lead you in a straight line. A topographical map has the ability to tell you the height of the terrain you are standing on as well as being able to orient yourself to finding your way back on the proper path can cut down on the time a person spends out in the elements. A GPS could end up leading you straight to the edge of the face of a cliff without any real direct route to acquire a way to navigate around such as obstacle. Maps not only save lives, but time as well. People who get lost can start to get dehydrated and exhausted, which can lead to becoming even more disoriented than they were when they originally lost the path they were on. This can lead to other unintended consequences that are much more expensive than paying a few extra dollars for a reusable topographical map. Such as having to pay for the expenses of a mountain rescue team that is sent out to find the people who have become lost out by themselves. Topographical maps tell more than just the locations of where people are at. They have a wealth of important information on the landscape and all it contains for people who are navigating around in it. In addition to showing any potential landmarks, sites, or other important locations; topographical maps also indicate the elevation of the area you have to travel in order to get from where you are standing to where you need to finish. In other words, it won't just show you that there is a drop off into a ravine, but the height between the bottom and start of the drop-off. It will indicate if there is a way to navigate around the area in order to reach your destination, and which paths provide the best slopes in order to make sure extra effort and energy hasn't been needlessly used to get there. After learning how to read a topographical map, a competent navigator will be able to not only determine how to get from Point A to Point B, but also be able to determine the easiest and safest route to get there. For people who are just starting out learning how to read a topographical map and using a compass to navigate around it; they should consider learning how to do it in an area just outside of town that is fairly flat and easy to navigate. It will make it more likely for those who take the time to practice learning how to use the basic skills on a compass and topographical map on a test run to safely navigate out of a bad situation should they have to put those skills to use in real life during their trip.